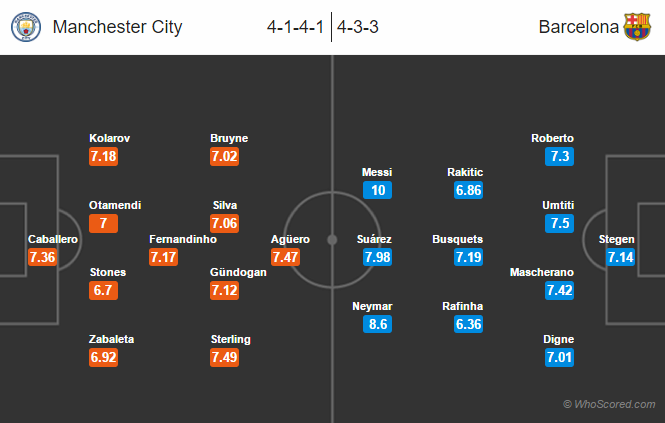 Champions League match preview Manchester City vs Barcelona, Group C. Important things to know. Referee: Viktor Kassai (Hungary), Stream Guide: Watch Live. Sergio Aguero will be back to the starting eleven after missing out the last game at Camp Nou. Willy Caballero will take Claudio Bravo’s place due to his suspension. Duo defenders Pablo Zabaleta and Bacary Sagna remain doubtful for this game. Yaya Touré is ineligible to take part in this competition. Fabian Delph has returned but is not ready for first team action. Vincent Kompany is expected to be start from the bench. Jeremy Mathieu who picked up the red card in the last game is out. Barca will also be playing without two more defenders Gerard Pique and Jordi Alba, both out through injury. However, the latter might make a surprise return. Andre Gomes, Denis Suarez, Arda Turan and Rafinha all are set to fight to replace Andrés Iniesta who is out through injury. Barcelona have won their last three Champions League games. Manchester City have won only one of their last six games against Barcelona in Champions League. Barca have scored 13 goals in their last three wins in the Champions League. Manchester City 2 – 2 Barcelona, Luis Suarez on the score sheet for the visitors.